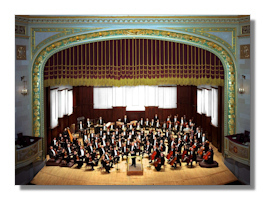 On February 22, 2013, I concluded my first series of concert reviews covering the Detroit Symphony Orchestra with a performance of Beethoven's Ninth. My mother had encouraged me to consider reviewing the orchestra, and the ensemble graciously allowed me to cover the 2013 Beethoven Festival. My work with Classical Net and the Detroit Symphony Orchestra has allowed me so many opportunities, and so my sincere thanks to my mother, my boss, Dave Lampson of Classical Net, and the past and present staff at Orchestra Hall. The Ninth last appeared in Detroit as the conclusion of the 2013 Beethoven Festival in Detroit, the success of which led to similar two-week spotlights devoted to Brahms, Mozart, and Tchaikovsky. Fittingly, especially given his concurrent work in Lyon, Leonard Slatkin will conclude his Detroit tenure next year with a similar set of concerts devoted to French music. This weekend of Beethoven was Slatkin's final set of Detroit performances for the 2016-2017 season. As always with this highly talented, but increasingly inconsistent musician, Slatkin's performances were both good and bad. First, the good. Corigliano's inventive and musically challenging Mr. Tambourine Man was masterfully sung by Hila Plitmann. Tremendously expressive and blessed with enormous vocal gifts, she truly absorbed the text and used her considerable communicative powers to give each word meaning. The orchestra shared her passionate outlook, and Slatkin seemed unusually energized. In the main, the May 18th performance of the Beethoven was full of vigor and personal touches. The Friday, May 19th performance was not as subjective, but still very well played and fully committed from all involved. Especially on Thursday night, the brass section was carefully balanced and exuded warmth and energy. The winds and strings were their usual excellent selves, and Slatkin's big-boned, Romantic conception still holds up well. Just as they did for Slatkin's last performances, the UMS Choral Union was superlative. Unfortunately, there were real problems both nights with the Corigliano. Frankly, the orchestra overpowered Hila Plitmann to the point where nobody could hear her. I'e heard that the livestream was adequately balanced, but that didn't help us listening live, and as a result the efforts of the soloist felt wasted. I went with three different musicians and two additional amateur singers over the two nights, and we all agreed this was a problem. This has been a serious issue for the conductor and orchestra over the past few seasons, and in an acoustically perfect hall this is unacceptable. I'e been inclined to lay the blame at Slatkin's feet, but guest conductors have also had some challenges, and so I can only say that it needs to be fixed as soon as possible. In the Beethoven, Thursday's performance was highly individual, but also stylistically incoherent. Deeply old fashioned in places, there were also moments where period-practice elements snuck in. Slatkin still does quirky things with the Scherzo, and some fiddling with the dynamics were also interesting. Friday's performance was less idiosyncratic dynamically and stylistically, but it was also heavier and less cohesive from an instrumental point of view. Both evenings featured a capable but not especially well matched solo quartet. In short, both nights were lacking in some areas, but had great moments. Like many performances in Detroit, this was very good, but there are still serious problems.